The Rolling Stones have been touring for over fifty years, delivering some quintessential rock songs along the way. As a result of their success and longevity, they have been the subjects of countless books and articles. The Stones hold a special place in my heart. Their concert at Rich Stadium in 1997 was a part of our honeymoon celebration, held only four days after our wedding. They played “Memory Motel,” which has always been one of my favorites. 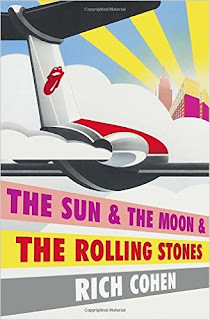 Rick Cohen’s The Sun, the Moon, & the Rolling Stones grabbed my attention on the bookshelf at the Lockport Library. I guess we all love a little dirt on some of our favorite celebrities, and I was hoping to learn a little bit more about the Rolling Stones. They have definitely forgotten far more than we’ll ever know about their music. Maybe in the telling of stories to the author, new nuggets of information leaked out. That was my hope anyway. This book is less a history of the Rolling Stones and more a love fest for the band by the author, especially for Keith Richards and Charlie Watts. The other band members, in the eyes of Rick Cohen, are worthy of ridicule. There seemed to be big targets on Mick Jagger and Brian Jones. Keith, however, is treated like the Second Coming. It actually gets quite laughable at some points. But enough about the bad. What’s good? The whole rest of the book. Sure, it is a rehash of some of the stuff we’ve already over and over about the Stones. It all comes down to the telling. Cohen, as a superfan, delivers these stories in one of those campfire moments. He’s excited about the band he’s just seen, and he’s telling all his friends the stories of his adventures of seeing the band. Sure, we know there’s a lot of crap and he’s exaggerated, but it sure is fun to listen. We all wish we could be part of the stories. Cohen regales us with his introduction to the music of the Rolling Stones and then, later, about the times Rolling Stone magazine sent him on tour for a feature. He gives us a glimpse as in insider to the life on the road with the Stones, or at least what he thinks is the inside view. Mick is aloof, the other band members mere shadowy figures in the background, while he really only interacted with Keith and Charlie. With so many stories out there already about the Rolling Stones there’s not a lot of new things in this book. It is fun to read, and Cohen’s folksy charms keep this book very readable. I liked his inclusion of his own life moments with regard to his interaction with the band and their music. While not the best book on the Rolling Stones, I still think it was worth the read. Rick Cohen’s The Sun, the Moon & the Rolling Stones is simply fun to read. And isn’t that what reading should be all about? The more fun I have reading, the more I like the book, even if the content isn’t always intellectually stimulating. But it’s rock music. It’s not supposed to be that intellectually stimulating. Craig Bacon loves music, especially live music. His friend George recently wrote a fantastic piece. You should listen.